Pennypack Park was established in 1905 by ordinance of the City of Philadelphia to insure the protection of Pennypack Creek and the preservation of the surrounding land. The park consists of 1,600 acres of woodlands, meadows, wetlands and fields. Pennypack Park is the green heart of Northeast Philadelphia; a natural world in the midst of urban development. Throughout the park's woodlands, meadows, wetlands and fields you will see many species of birds, mammals, reptiles and amphibians which have been native to this area for thousands of years. The rich history of Pennypack Park began with the Lenni-Lenape Indians who hunted and fished along the creek and from whom the park takes its name. In 1683 William Penn acquired the title to this land from the Lenni-Lenape people. Many historic structures are still intact throughout the park. In 1697 the Pennypack Bridge, one of the oldest stone bridges still in use in the United States, was built on King's Highway, now known as Frankford Avenue. The Pennypack Baptist Church another of the park's historic sites, was built in 1688. The Verree House on Verree Road was the site of a raid by British troops during the Revolutionary War. The Pennypack Valley was a center of industry throughout the nineteenth and early twentieth centuries with many mills and factories dotting its banks. The remains of this era are evidenced by the ruins that can still be located throughout the park with careful inspection. Today Pennypack Park is a natural recreational area for all to enjoy. 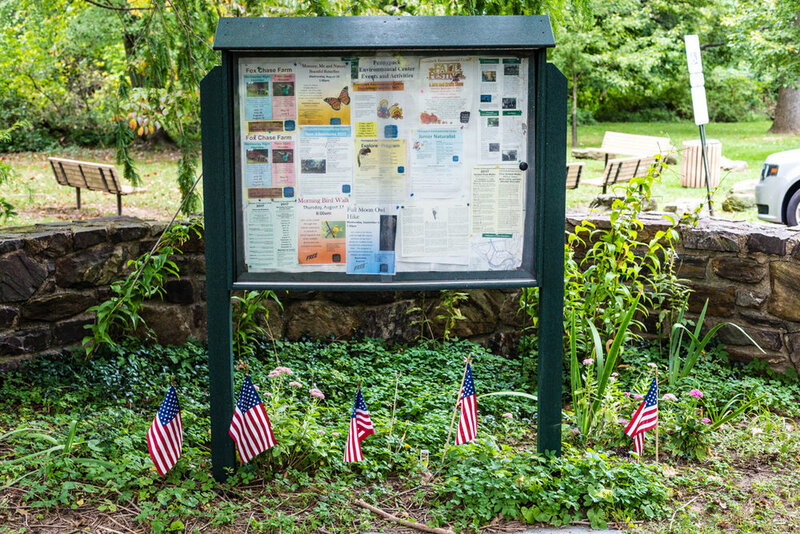 Popular activities include hiking on miles of back woods trails, horseback riding, bicycling on the park's nine mile paved bike path, picnicking and fishing in the Pennypack Creek. More than 150 species of nesting and migrating birds can be seen in the park, such as the tiny Ruby-Throated Hummingbird, the Great Blue Heron, Warblers, the Pileated Woodpecker, several kinds of seabirds, Ducks, Geese, Hawks, Great Horned Owls and the little Screech Owl to name only a few. Pennypack Park is also home to the Bald Eagle, which has a nest by Pennypack on the Delaware. Pennypack Park is famous for its large, scattered deer herd but is home to a large variety of mammals, including several kinds of bat, the Red and Gray Fox, Rabbits, Chipmunks, Mice, Muskrats, Woodchucks, Raccoons, Skunks, Opossum and the long-tailed Weasel. The park is home to many reptile species including several kinds of snakes, Box Turtles, as well as Snapping Turtles and Painted Turtles, Spring Peepers, (a small brownish tree frog), the Common Toad and several kinds of salamanders.